This medical and technical complementarity with your usual practitioner insures you an optimal follow-up, from your first visit until the control visits which take place in our surgery within the months and the years that follow the surgical procedure. To accompany you, all our team is fully trained to the advanced techniques of implant surgery procedures. You will benefit from their professionalism and from their special care during all the phases of treatments. Our practice is endowed with 3 treatment rooms, 2 surgical units, a sterilization standards room , a 3D imaging system replacing the scanner, as well as an surgery desk for personal use and a rest (relaxing) room. All conditions are combined for a perfect success of your implant. 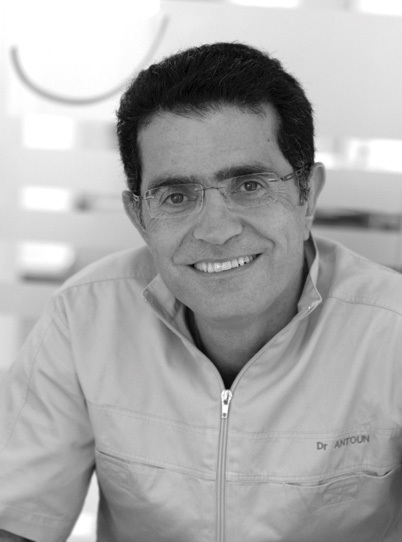 Dr Hadi Antoun is a holder of a degree of dentistry, Implant surgery and Prostodontics from Paris VII University. His private practice is exclusively devoted to the periodontology and the implant surgery. He is specialized in the advanced Implant surgery and in bone grafting. Co-author of the book ‘‘Bone Augmentation in oral implantology’’, he also wrote numerous national and international publications. In 2010 he receives an award for the best speaker SOP/Dentsply Maillefer and is appointed as expert at the appeal court of Paris. In 2011 he publishes a book about bone, and sinus grafting in implantology.